After having scored 5 goals last Sunday, Real Madrid extended their high goalscoring streak on their visit to Alcoyano, beating the home side with a clear 1-4 result. Cristiano Ronaldo didn't travel with the team, as José Mourinho decided to rest his key player and save him for this Saturday's fixture against Real Zaragoza, as well as next week's UEFA Champions League crucial match against Borussia Dortmund. There were no room for surprises this Wednesday night at the "El Collao", in a game where Real Madrid visited and defeated Alcoyano by 1-4, for the 1st leg of the Copa del Rey last-32 round. Cristiano Ronaldo, Pepe, Sergio Ramos, Xabi Alonso and Ozil were spared from this match, but nonetheless, the Merengues confirmed their favoritism and made sure they almost sealed the deal at the end of this first leg game. Karim Benzema with a brace, as well Kaká and José Rodriguez with one goal each, scored the goals for the Spanish champions side. Real Madrid and Alcoyano will meet again to play the second leg on November 28, but this time at the Santiago Bernabéu. Alcoyano's resistance lasted for roughly 20 minutes, precisely until Karim Benzema exploited an error from the home side defence. A long ball sent deep in Alcoyano's half ended up being poorly cleared away twice in a row, with the last header leaving the ball in a very dangerous zone. Karim Benzema reacted fast and anticipated the goalkeeper as the ball bounced in front him, heading it into the back of the net and putting Real Madrid one goal up. The goal turned out to be very important not only for granting the lead to the Merengues, but also due to its effect in terms of bringing down hopes in Alcoyano. With 35 minutes played, Kaká, who was Real Madrid's captain this Wednesday night, picked up a ball after a small touch by Karim Benzema, drove it a bit to the left to find some space and fired a crossed strong shot into the far post. Two goals lead for Real Madrid and no response in sight from the home side so far. There were no changes on the result until half-time, as Real Madrid only got back to scoring deep on the 2nd half. Near the 67th minute of the game, Benzema and Kaká combined well in between several Alcoyano defenders, just before the Frenchman assisted Jesé Rodriguez, near the edge of area. 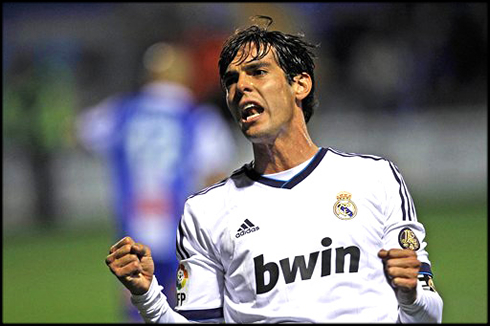 The "Canterano" showed his class and curled the ball into the far post, extending the Merengues lead to 0-3. With the Spanish League and Ronaldo returning to action next weekend, you can look for updates on Mobi-Football, as they provide the latest football news on all major leagues, including La Liga. Real Madrid will clash against Real Zaragoza, while Barcelona will host Celta de Vigo. In the UK, Manchester United will lock horns with Arsenal, in what promises to be another exciting game! Cristiano Ronaldo next game for Real Madrid will be against Real Zaragoza, for La Liga, this Saturday night (03-10-2012). You can watch Juventus live stream, Real Madrid vs Zaragoza, Barcelona vs Celta de Vigo, Manchester United vs Arsenal, Swansea City vs Chelsea and Tottenham vs Wigan, all matches provided from our soccer live section.